The Baroque Concert performed by Collegium Ducale in Venice is an experience that even the most seasoned music lovers will want to enjoy; an event that celebrates two of the greatest composers of all time, Antonio Vivaldi and Wolfgang Amadeus Mozart. 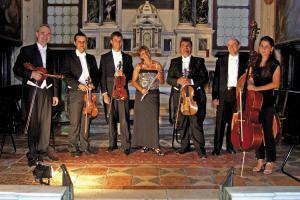 Formed in 1993, what sets Collegium Ducale apart from many other orchestras is how it interprets its repertoire. Audiences hear music that is true to the period in which it was written. The ensemble does not simply play but takes pride in its careful study of the musical eras it chooses for its performances. Settings matter too and it is difficult to imagine one more intriguing than that chosen by the Collegium Ducale: the Palazzo delle Prigioni. The Prisons’ Palace, or New Prisons as the building is often known in English, was built between the late sixteenth and early seventeenth centuries. More cells were needed, in addition to those in the Doge’s Palace, to accommodate Venice’s criminal class. The two palaces are intimately linked by the famous Bridge of Sighs that crosses the Rio di Palazzo. The name of the bridge is a romantic invention, an imagining of how prisoners must have felt, glancing across at their beloved Venice as they were led from the magistrate’s court to the dungeons. In both Vivaldi and Mozart’s times, the Palazzo delle Prigioni would still have been used to lock up the city’s miscreants (the last of the Doges did not abdicate their position until 1797). Since 1922, when its buildings became home to the Artistic Circle of Venice, the Palazzo delle Prigioni has had a very different purpose: a space in which to celebrate the very best in music and art, from Italy and elsewhere. In Collegium Ducale’s Baroque Concert, Mozart’s String Quartet No.3 in G major KV 156, written in 1772 when the composer was in Milan, and often referred to simply as a divertimento, precedes Vivaldi’s masterpiece of 1725, The Four Seasons. Pristine music that evokes a bygone age, but which still sounds as fresh to us now as the day it was written. One suspects that Mozart and Vivaldi themselves would have approved.